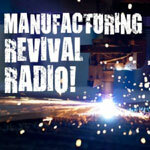 I have had the great pleasure in participating in interviews on Manufacturing Revival Radio (manufacturing-revival.com). An interview with one of the hosts of Manufacturing Revival Radio, Todd Youngblood, on the work of Pearce Communications Group. A talent management roundtable that addresses the topic, Building a Contagious Culture for Growth.